Metal fixed braces – or train tracks – are the most well-known orthodontic appliance. The brace consists of metal brackets which are glued to the teeth. A wire is then slotted through the brackets and secured with small elastic bands. These elastic bands can be in any of a variety of colours and are the reason why some people term train tracks “coloured braces”. Lots of patients enjoy choosing their preferred colour; even better: the wires – and colour – can be changed at each adjustment appointment. Depending on your treatment you will need to see the orthodontist every 6-8 weeks to have your braces adjusted. At these appointments your wires and elastic bands will be changed and the brace modified as required. METAL BANDS. These may be applied around your back teeth to help hold the archwires in place. If required, these may take 2 visits to place, as we have to create a gap between the teeth for them to fit. We do this by placing small elastic separators between the teeth for a few days. ELASTIC BANDS. These are fitted between certain teeth to help move the teeth. HOOKS. Hooks are used to attach springs or elastics on the wires or brackets. Miniscrews (TADS) are little screws placed in the gum under local anaesthetic. They act as anchors so that teeth can be pushed or pulled from them. 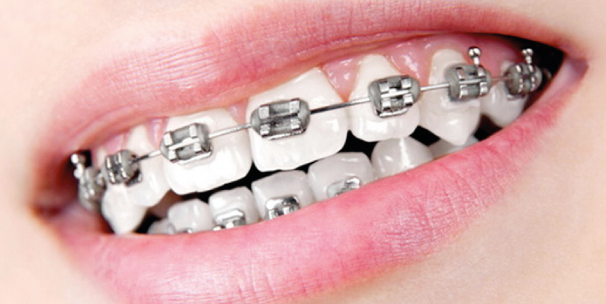 Metal braces are the only braces available on the NHS for both adults and children.